Hello there! 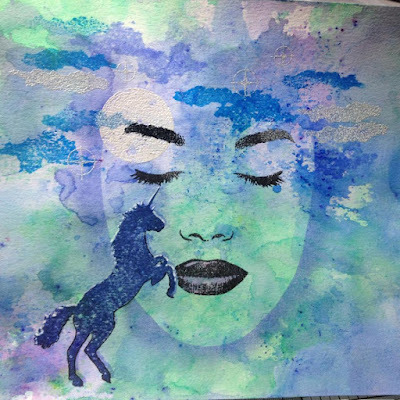 Thank you for coming to check out today’s inspiration here on the Visible Image blog. **Warning*** Photo heavy post ahead so get your eyeballs ready for some visual happiness! I had some messy fun in my studio and I can’t wait to share the results with you all! 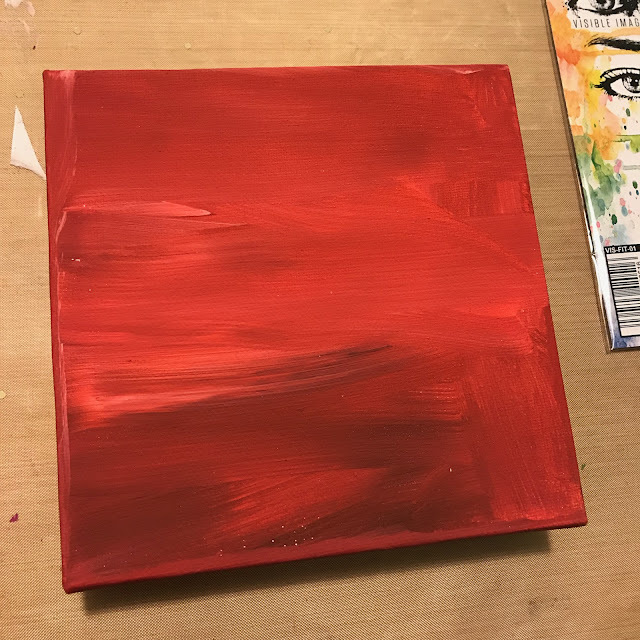 I’ve had this bright red canvas staring at me for quite some time. I’ve always thought it’s just been too obnoxiously vibrant, but tonight I decided to conquer it. 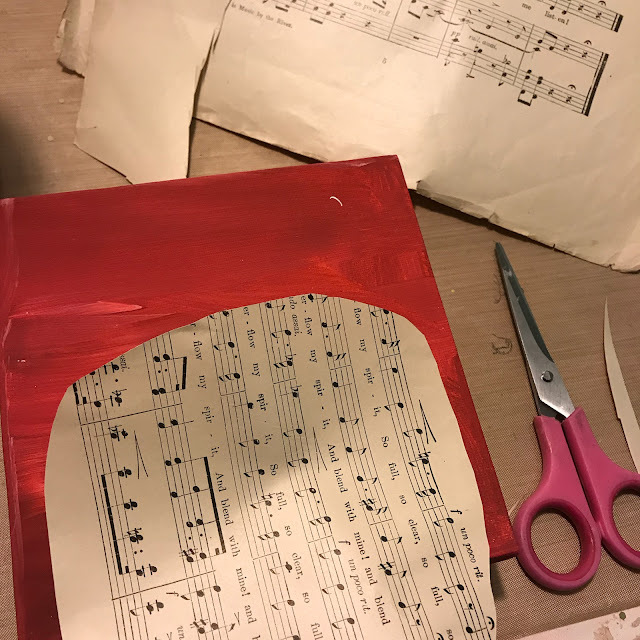 I used a sheet of old, old music given to me by a bloggy friend and cut it into a face shape. I LOVE how easy it is to make emotive faces with the Face It! stamp set from Visible Image. I stamped the closed eyes onto the sheet music. I used some Dina Wakely Scribble Sticks to add some colors to shading. 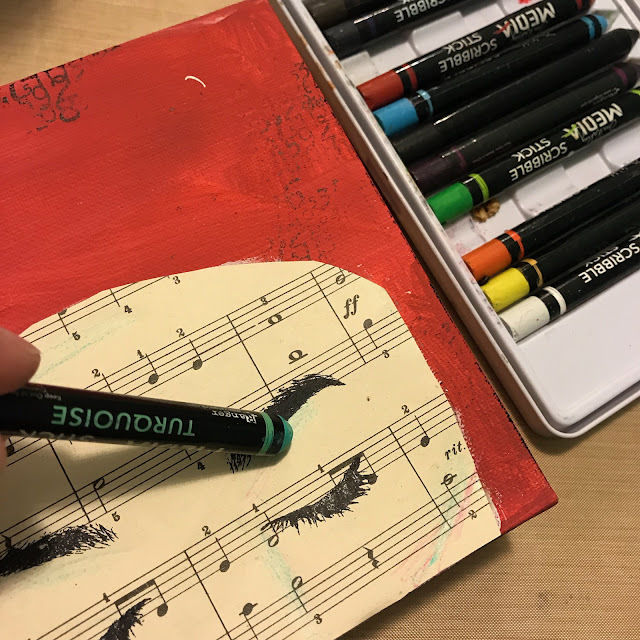 Even though Scribble Sticks might not look like much when you scribble them on, as soon as water is added to them, they activate and make all kinds of gorgeousness. Around the edges of my face, I used some Faber Castell Gelatos to add depth and dimension. I also stamped my background with some numbers from the Somewhere in Time stamp set to grunge it up a bit. 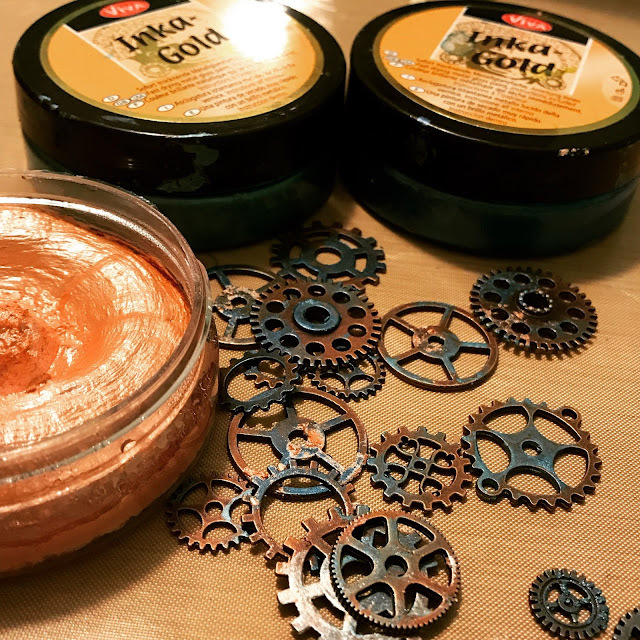 I took some metal gears and transformed them with some Inka Gold metallic paste. 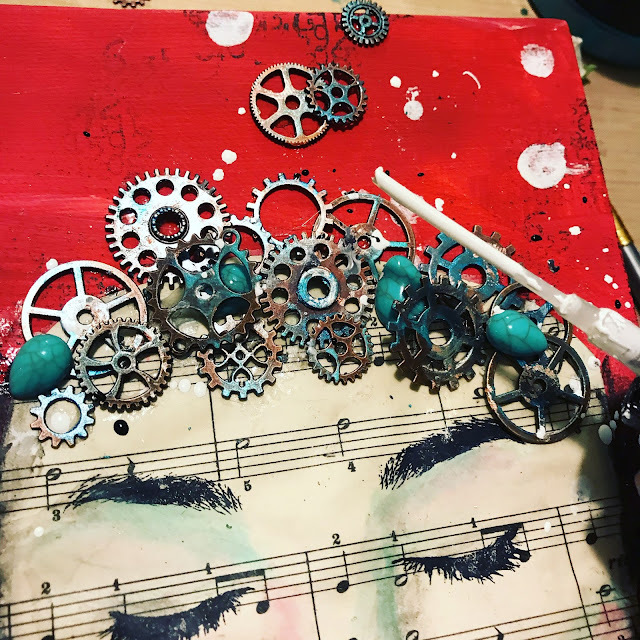 I glued down the gears to the top of my gal’s head, along with some turquoise gemstones and then sprinkled the whole dealio with some Picket Fence Distress Spray Stains. Pretty much in love with the way this turned out and no longer intimidated by all that red. I had to add the stripeys to the side to complete the whole shebang. Thanks for tuning in and have a very happy Monday! We will be back a little later with an awesome tag from Veerle Moreels… and a video too! Hope Monday is being gentle with you!! 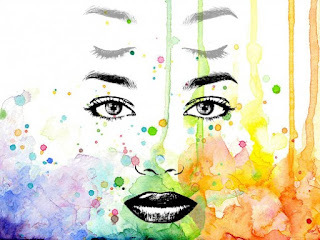 Today I made watercolor woman with stamps from Visible Image virtue of the fact that it is March 8 🙂 splashed her a little bit and pochlapałam watercolors. It looks great on my wall !. I used a little new and old stamps. I used the eyes once before and I’m a huge fan of them! Best regards and wish you all a nice day. Thanks for visiting our blog today. 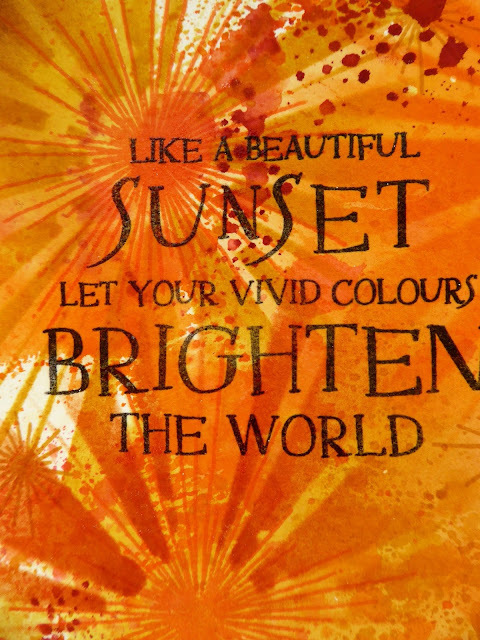 We’ll be back tomorrow with fabulous Friday inspiration from Pauline Butcher! Hello! We hope you are having a great weekend. Close your eyes… it gives you the chance to see yourself. Lay down some texture paste from the top to the bottom and let it dry. Once it’s dry color the texture paste with a light wash of both water colours. When this layer is dry you can lay down a more concentrated layer of color next to the texture paste to get some more depth. Cut a piece of Cut-‘n-Dry foam and lay down some glue used for metal foiling onto it. Work it into your foam using a palette knife. This is the stamp pad you will use to ‘ink’ up the stars. Ink up your stamp with the glue and stamp it onto your paper as you would when using ink. Don’t hold it to long onto your paper or it will stick and you will tear the paper. Just stamp and lift. When you have structured watercolor paper you could stamp it a second time using a stamping tool. 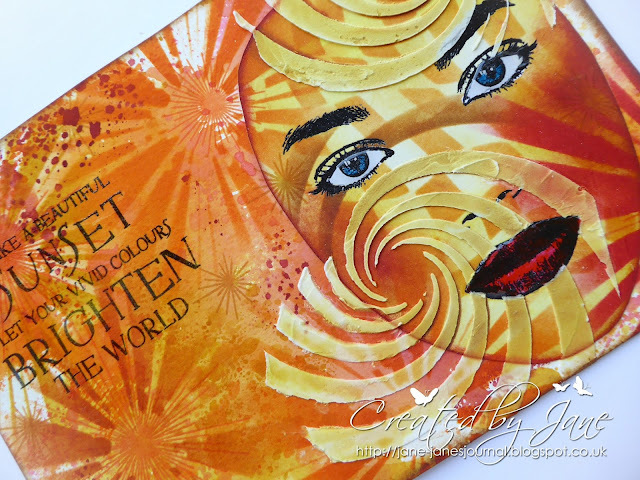 Cover your stamped image with the golden metal foil and burnish before removing it. Put some glue onto a piece of plastic and pick up just a tiny bit with your palette knife. Wipe this over your structure paste to make some parts sticky so you can lay down some golden metal foil here too. Cut a piece of plain bandage and color it with both watercolors. When this is drying stamp your sentiment on some paper . I have added some light touches of colour here too. Using a needle, toothpick,… you can put tiny dots of glue onto your tag to add some little golden accents. 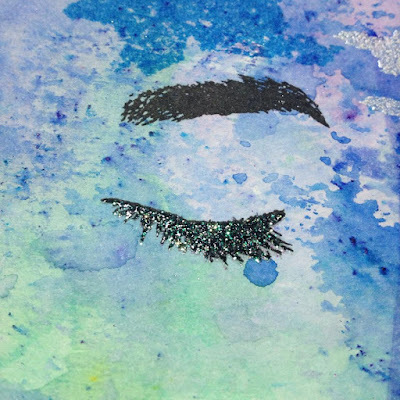 I have also splattered some tiny dots of both water colours onto the background. When the bandage is dry adhere it behind your words. Ink up the edges of the tag before gluing it down onto the black base. Only thing left is to adhere the words to finish off the tag. *TIP: if you work onto watercolour paper and use a lot of water you could see that your paper starts wrinkling or bending. When it’s dry to the touch you can put it in between some papers and lay it under something very heavy to get it straight. In the meanwhile you can stamp words or do some coloring. 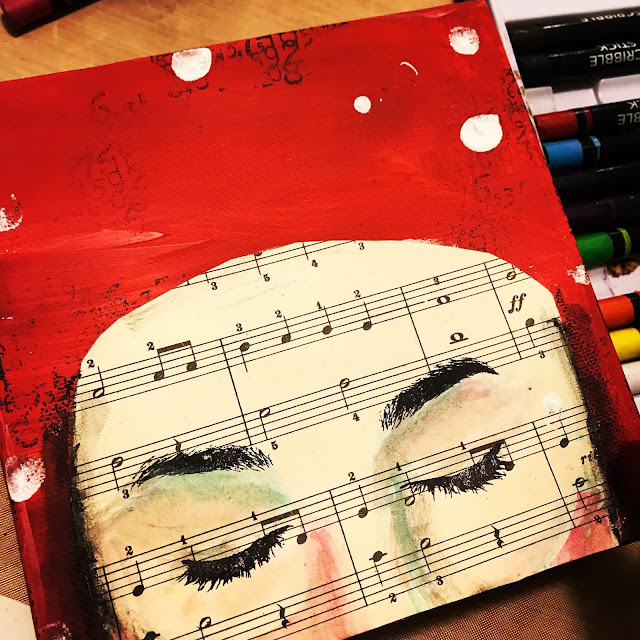 **TIP: to get the eyes and nose-mouth spaced out correctly, lay down the printed sheet underneath your stamping block and place the stamps on the right place on your acrylic block. We will be back tomorrow with a brand new week packed full of inspiring projects from our awesome team! If you have missed any of our recent blog posts you will find them HERE! Hi there! We hope Monday has been gentle with. you! Now that we have reached December, autumn is fading fast and winter really is just around the corner. Darkness arrives by late afternoon and the temperature is dropping like a stone. Autumn 2017 really has been quite exceptional here in the south of England. Warmer that normal temperatures and lots of sunshine kept the leaves on the trees and turned them into every fiery shade of gold, red and orange you could imagine. These have really fuelled my crafting muse and I thought I would share an autumnal nature photo as a last ode to autumn. Today is also my Monday inspiration for Visible Image and I decided to make an autumn sprite to say goodbye to this season of mists and mellow fruitfulness. 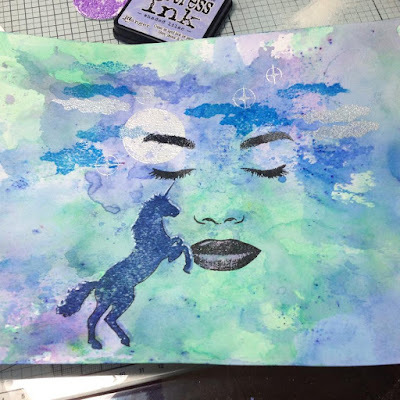 I used distress oxide inks and the wonderful Face it! stamp set.. I added masking fluid to keep her eyes white and then built up the inks using the wrinkle free technique. 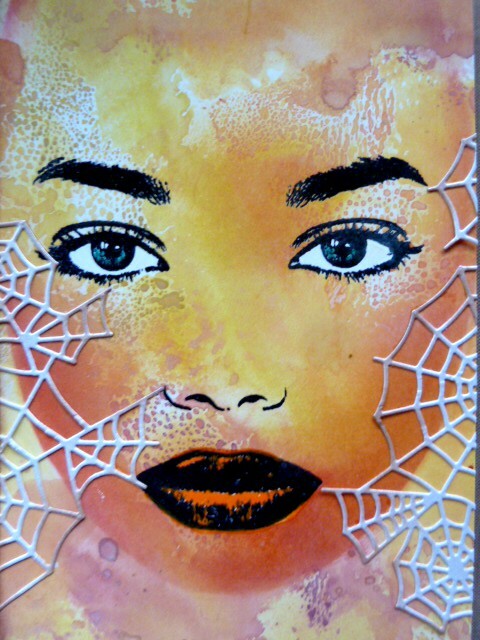 I then used the Stencil to create her face by blending some more inks. and leaves which were stamped with script from the Scripted Streets set. I gave some extra crackle too. I also added details to her face from the Create it set. 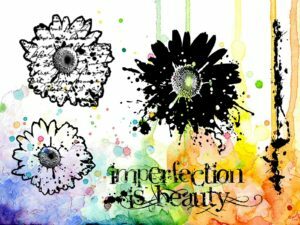 The sentiment is from the Imperfection is Beauty set. she is saying a fond farewell to autumn 2017. Thanks so much for stopping by today and for the kind comments you take the time to leave me, especially at this very busy time of the year….are you ready? We will be back tomorrow with awesome inspiration from Tenia Nelson! I am sharing my weekly Visible Image inspiration project which I have called “The Snow Queen”. and teamed them with one of my all time favourite sets.. I stamped the face and added some Distress glaze to seal the lips. 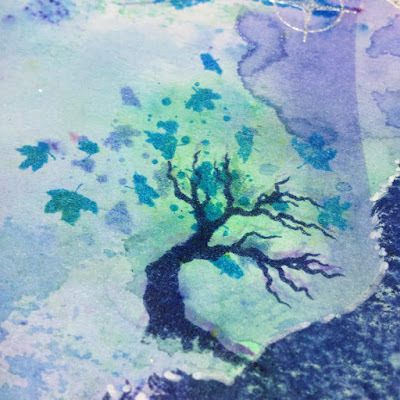 I very roughly blended some blue distress inks…making them look quite swirly to look like snow swirls. I stamped the sentiment with Versafine and added the sweet reindeer and star. The little accents in the Peace, Love , Hope set are very sweet and I have used them on lots of my Christmas cards. I also added some DecoArt snow-tex around the edge of my card and sprinkled glitter on top for a really frosty effect. I love these new Christmas stamps Mark has designed… all the sets work so well together. I have been busy making some other designs too which I will share very soon. Thanks for stopping by today and for the kind comments you take the time to leave. We are rapidly approaching October now and it’s time to get those Christmas cards started…. only 87 days to go… ho ho ho!! 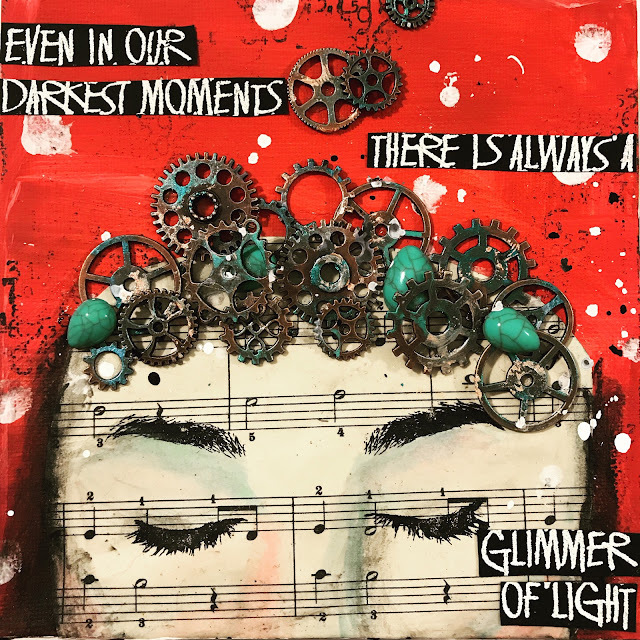 Thanks again for visiting our blog today, and don’t forget to enter your cards and projects featuring our stamps and stencils into our Facebook group challenges for your chance to WIN a prize! Posted in Christmas stamps, Design Team inspiration, Face it! ‘A Splash of Colour’ is the theme for the challenge this month over at the Visible Image Facebook group. There will be wonderful inspiration showing the different ways to add a splash of colour to your project by the DT throughout the month. The background is from my stash. The “Face It” stamp set is one that I haven’t played with much, so it seemed like a good idea to play with it. The best part of this set is how the placement of the parts is all worked out for you and you have a choice of eyes open/eyes closed. 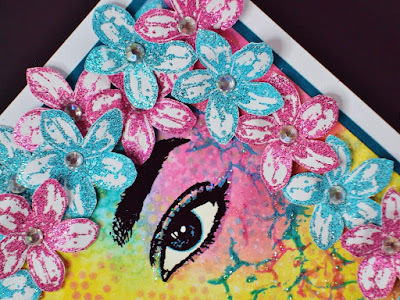 You will find more of Dot’s awesome cards and projects over on her blog. Enjoy the rest of your Saturday and thanks for visiting us here on the Visible Image blog. Last Sunday I hosted a Workshop in Warwick, we played with some Visible Image MDF Monoliths, and I’ve used one of the techniques, that I introduced to a fabulous group of Crafters. 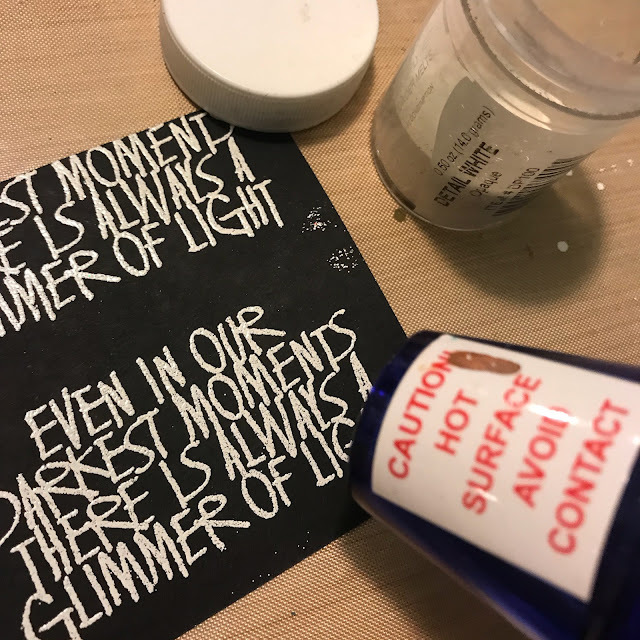 I stamped and heat embossed the gorgeous face onto some heat resistant acetate, using black embossing powder, fussy cut all the facial features, then added them to the monolith using glue gel. I stamped and heat embossed the tree, leaves and the sentiment, straight onto the Monolith. the tree and leaves from Create it! and the sentiment from Own it! a real must have set, to be able to write whatever you want to! I stamped all the letters I needed onto a separate piece of card, then stamped the squares and circles. We still have lots more to come on the blog this week… so we hope you will visit again soon, or find us on your favourite social media platform. Hi! Thank you for visiting our blog today. We have been catching up with all the Design Team inspiration created over the past few weeks with our NEW stamps. If you have missed any of our posts you will find them HERE! Wow did you see Visible Image on the Create and Craft show? How am-az-ing it was!! The Face It stamp set sold out in 26 minutes!! And the Curious Cat set within the first half hour. All but a handful of stamps sold out within that hour. Mark’s demos were fabulous and it was such fun spotting all 5 of my cards on the show together with the other awesome samples my fellow Design Team members had created. This is my first official Design Team post for Visible Image! At the moment I am having to craft in the kitchen as it’s far too cold in my garden studio. Billy sits next to me at the breakfast bar… here he is keeping check on what I’m doing. Sooo back to my design team card for today. It is the 2nd sample I made for the Create and Craft TV show. This amazing set is called Face it! I also used 2 sets of words from the sentiment set, called Own It! which works perfectly with Face It…and of course just about any other stamp you own. This set will also be perfect for my art journal moments. I made 2 Face it cards, I’ll share the second one soon.. if you saw the show it’s the very retro rainbow striped card. I decided to make an easel card as it’s been so long since I have made one and they are always fun to do, if a little fiddly. The cards I make that sell in Dotty’s Tearooms need to be flat and not too thick for posting, so this was an great opportunity to do something different. I stamped and embossed both eyes open and eyes shut onto my card. I masked off the open eyes and both set of lips. For the front of the easel I used Distress inks and blended a background. I added a little bit of stencilling. I then added some Sparkle Medium through a heart stencil for some glittery texture. I changed my mind re the sentiment, see the photo below. I decided to cut up the words on snippets of cards and then mount them on a snippet of black card. I coloured the lips and added Glossy Accents for dimension and left them to dry. 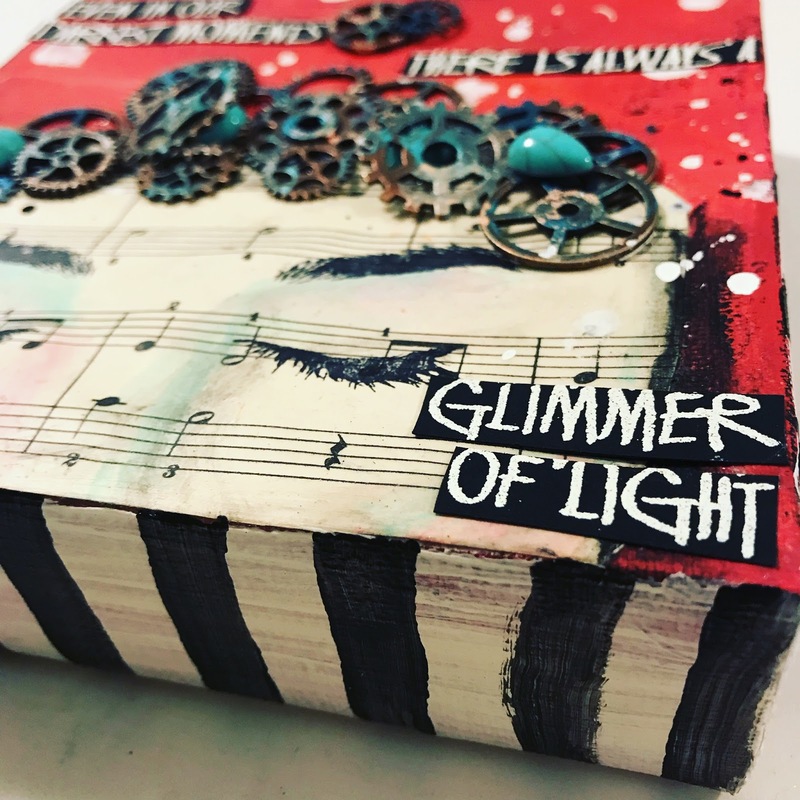 For the inside I masked as before and used a mix of Infusions and distress inks and also added some more Sparkle Medium, this time using a star stencil, my idea was that she was making wish…(stars) hmm are you still with me ? Then I put everything together. Here is my easel card…which I saw as the show opened on TV…. great fun to see it there. Thanks so much for stopping by today, for your ongoing support of my creative journey, and for the kind comments you take the time to leave me on my blog. I really appreciate them. This is such a stunning card and a wonderful idea ♡ Thank you Jane! Fabulous to see all the close up photos too showing all that gorgeous shimmer. You can find more of Jane’s wonderful cards and projects over on her blog. More inspiration coming up here on the blog, as we share an awesome tag from Veerle! 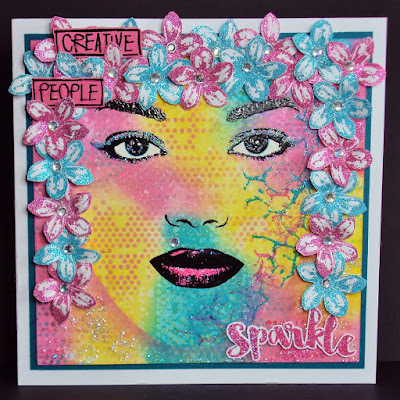 Hi there, we have another incredible card to share with you today, created with our Face it stamps. It’s time for another dose of Visible Image inspiration from me. 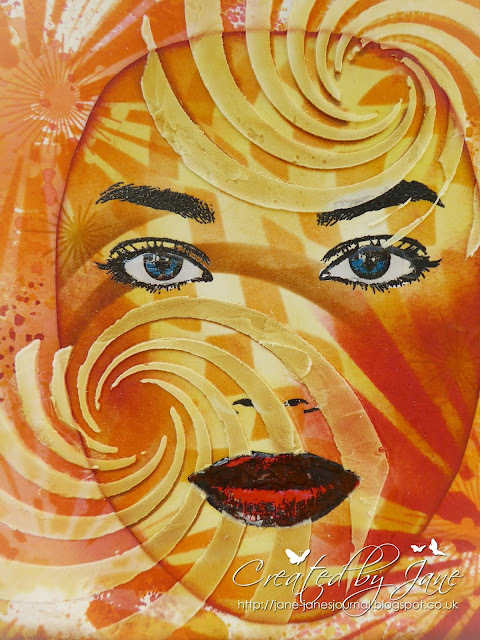 I have been combining the old with the new again this week and have a serene card using the fabulous new Face it! stamps. I stamped and embossed the sentiment onto white card then matted onto black and set aside. Once completely dry I stamped and embossed the face with black embossing powder, and the Visometry stamps with white embossing powder. I wanted some dimension to the card so embossed some of the smaller shapes onto heat resistant acetate and layered over the larger ones with 3d gel. Some super sparkly Prima gems in the centres finished the card. Wow! 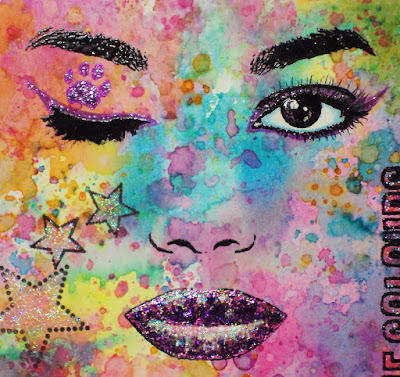 What a stunner.. thank you Teresa ♡ Loving our super cool Visometry stamps with the face stamps! 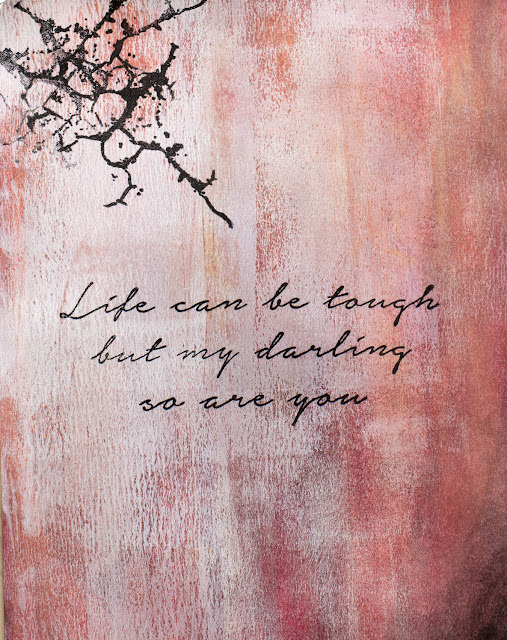 Stay tuned for more awesome inspiration here on the blog… coming up next we have a brilliant card from Dot! after neglecting our blog for a few weeks! 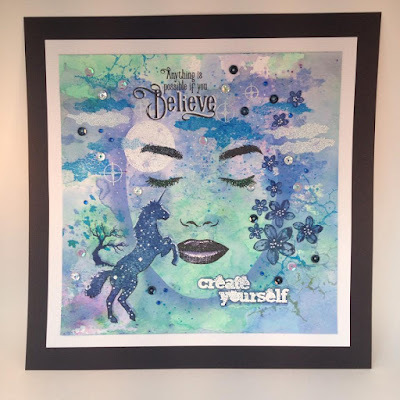 Hello and today I am sharing with you my very first ever canvas, created with the Face it and Create It Stamps by Visible Image. 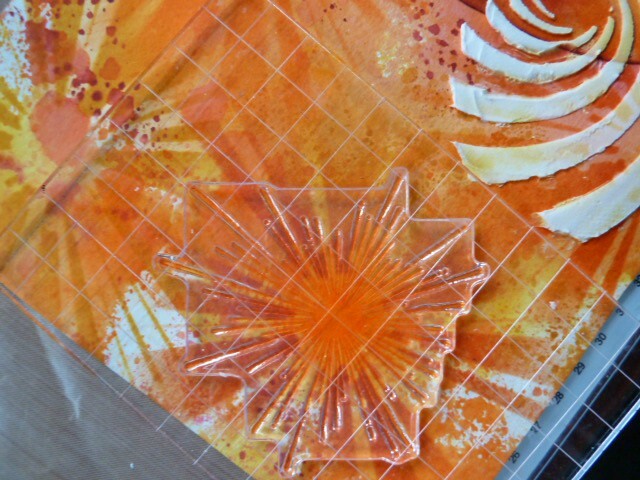 It measures 20 x 20cms and was created in an evening with plenty of stamping, colouring and cutting, and lots of fun! 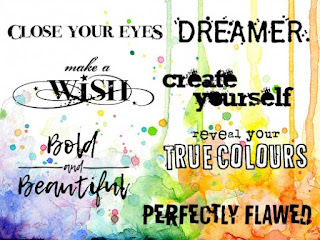 I simply stamped the features onto the canvas, using a large stamping block behind it, to get a good pressure with my stamp, and coloured from the edge with shades of green distress ink and a blending tool and paintbrush to keep the edges soft. so that I could capture the accurate detail of the iris and pupils). 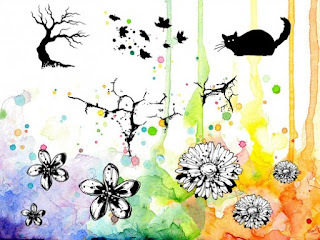 The flowers were simply stamped in Distress ink onto thin card, and then coloured with a waterbrush. I used all three sizes of flower from the Create It set, on some of them, to build up depth a bit more, then finished off the centres with Liquid Pearls. For the leaves… I simply stamped the flowers in green, and from each flower I snipped out two pairs of leaves and one single, which, by the time they were strategically positioned behind the petals, were unrecognisable as the same thing! The finishing touch was the butterfly, Visible Image of course, from the ‘Own Kind of Beautiful‘ set from last year. of difficulty – she looks as beautiful just stamped onto plain white, or softly coloured paper, as she does all adorned with flowers! So I can’t wait to see lots of interpretations shared in the Visible Image Facebook group. 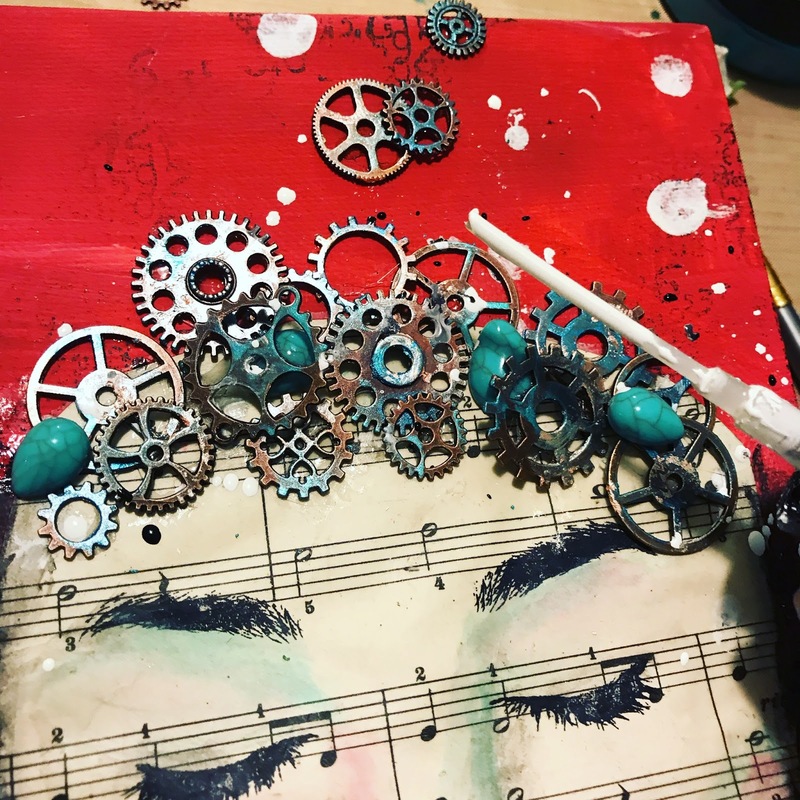 Stay tuned for a fabulous journal page from Corrie up next here on the blog! Hello! 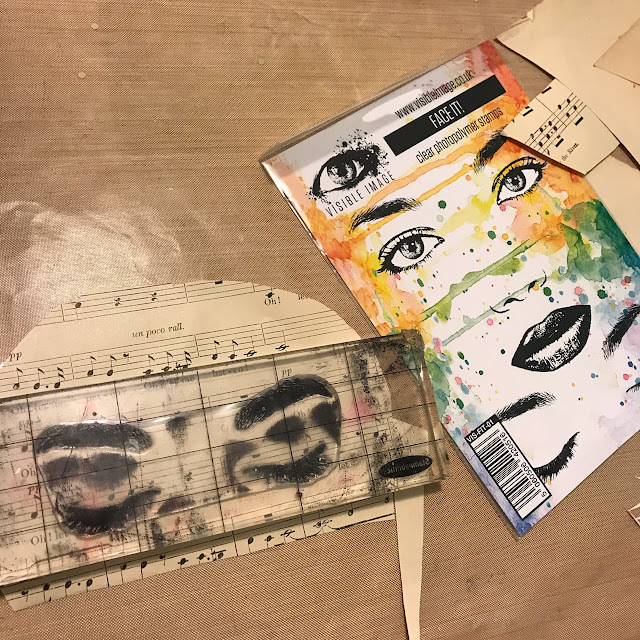 We are back to share another incredibly inspiring project created with some of our awesome NEW stamps! 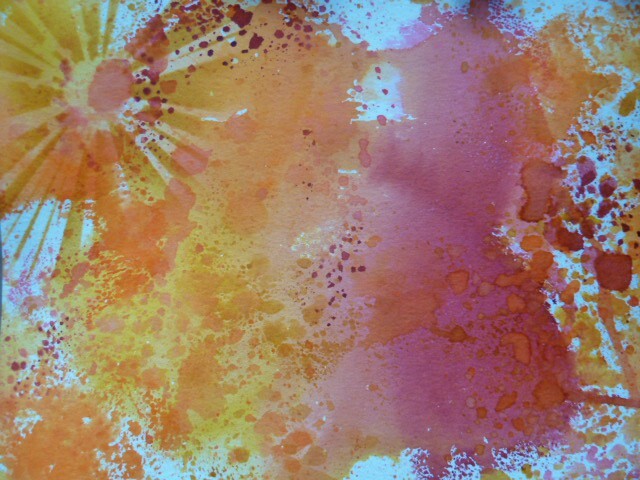 I took some card and spritzed some zingy Dylusions spray inks onto it to add a bright splash of colour. masking them off before spraying as the inks are very wet and may have seeped under the mask). I added a little colour to the iris’s with Distress Ink. I then took some black card and tore a strip out of it, then arranged over my eyes so that they were peeping through the gap. I stamped and embossed the sentiment, matting the ‘creativity’ onto an offcut of inked card. The remainder of the words were stamped and embossed directly onto the black card. We hope you are feeling inspired to get your hands on these stamps and show us how creative you can be! Thanks for visiting… and come back soon as we have more inspiration coming your way today. but I enjoyed every minute, even though it was challenging, and at times I didn’t breathe…! So it was quite the creative play!!! 1. I began by making my watery cloudy background on a piece of A3 Mixed Media Cardstock. where and I built up a whole A3 background very quickly. Then I selected the area on which to work and cut it down to 20 x 20cm size. glued with strong pva, and one gemstone, right over the splatted ink under the face’s left eye! This is incredible Nicky! Thank you so much ♡ You can just gaze at it for ages.. there is so much to discover! 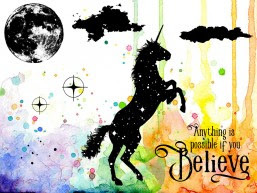 Love the ethereal feel to it… magical! Really shows off how much you need the mask and stencil to play with too. Thank you for visiting our blog today, we still have lots more inspiration to share with you. How lucky are we to have such an AMAZING Design Team showcasing our awesome new stamps! Hello! Thank you for coming to check out today’s inspiration! Another week has passed, does it go quickly or is it just me, lol !!!! new Stamp sets available from ‘Visible Image‘, they really are fresh and exciting. 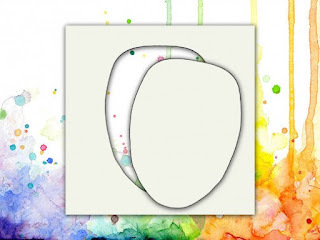 So today I’m sharing a card made using.. Face It! The sentiment is from Own It, the stars are from Born to Perform, and the paw print is from Curious Cats! spritzing with a little water, then gently tapping the card into the mixture, then drying it. I continued doing this with as many colours as I wanted, until I’d achieved a background I was happy with. Wow Black glint embossing powder. Then I stamped one closed eye, lining it up, and also heat embossing it. Wilted Violet Distress Ink, I also used this ink with a paintbrush for the eye liner, and the lips. 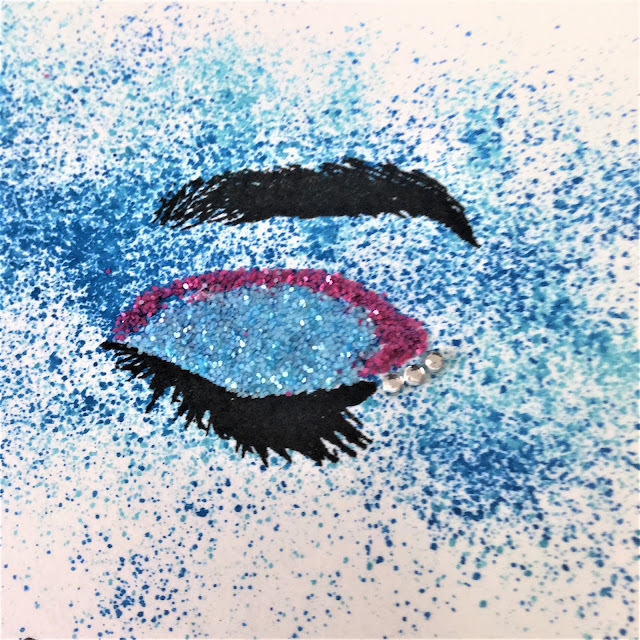 To finish off I used Lilac Stickles for the eyes, and Stardust Stickles on the stars and lips. I hope all you lovely people who pre-ordered these super new stamps, have got them now or you very soon will! Please put them to good use and enter the Visible Image ‘Show and Tell’ challenge..
there’s a chance you’ll win a £25 voucher, to spend in the shop! So get you photo’s into the album HERE. 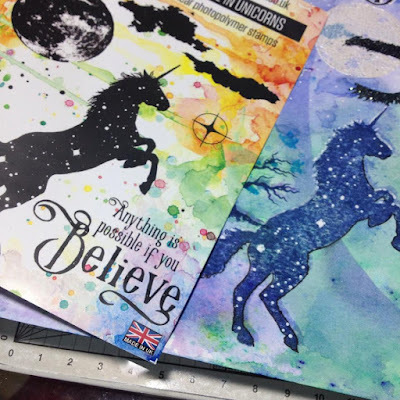 You can find more of Pauline’s fabulous cards and projects over on her blog. We received this card in the post today and it is even more spectacular in real life! It will be proudly displayed on our stand at the CHSI trade show next weekend. more inspiration from our incredible team over the next few weeks! Thanks again for visiting us here on the Visible Image blog today. Hello! 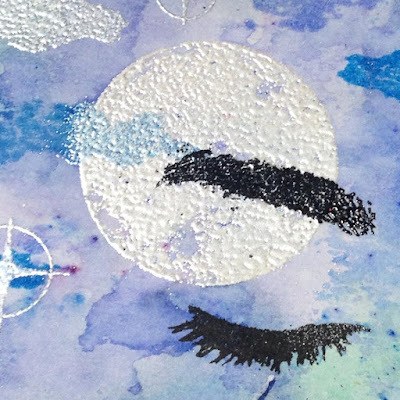 We are back with more amazing NEW stamps inspiration here on the blog today! Have you seen all the gorgeous new stamps Visible Image has just released? If you have missed some, you can view the entire new collection here! Using the face stencil is super simple. The only thing that may require some attention is the positioning of the eyes, nose and mouth. The eye line divides the head in half (measured from the top of the head to the chin), and a common mistake is to place the eyes either too low or too high. 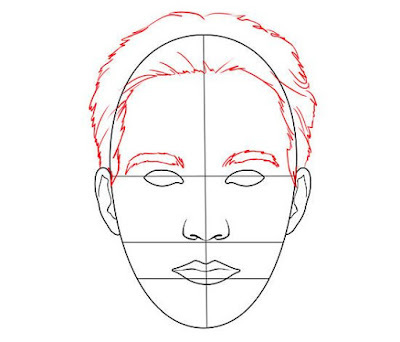 My impression was that the stencil is indicating the face shape only until the hair line, so the eye line is above the center of the stencil. Once you have the eyes in place, the printed face image on the stamp set will help you in positioning the mouth/nose. Wow! 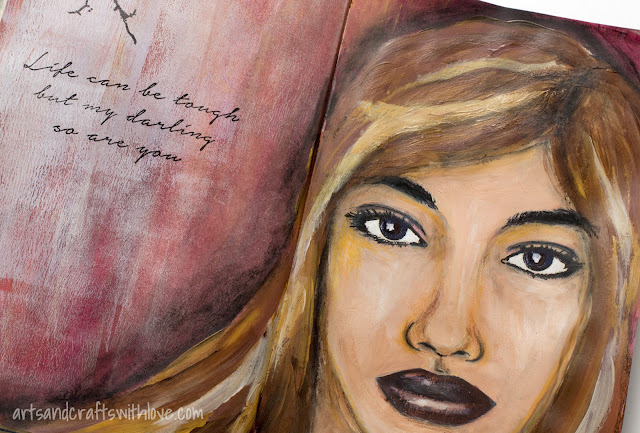 Incredible journal page Elina ♡ Thank you! 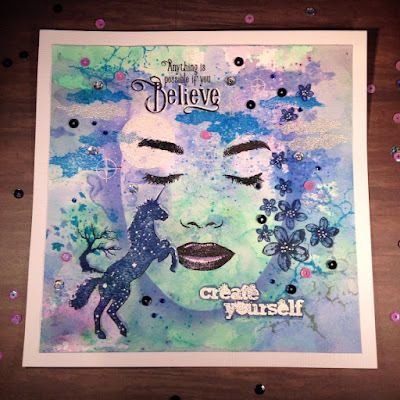 You will find more of Elina’s amazing cards and projects over on her blog. Thanks again for visiting, we will be back with some fantastic inspiration from Teresa a little later!